If you do what you have always done, you will never get further than you have always gotten. General classes focus on fundamental skills and fun, while building a foundation of technical proficiency for future growth in the game. Topics include: dribbling, passing, receiving, shooting and creativity. Advanced classes focus on individual player development, with more depth in certain aspects of the game. Goalkeeping Focus on the technical aspects of today’s modern goalkeeper. Topics include: handling, positioning, reactions, footwork, hand-eye coordination, confidence. Footworx Players will learn how to be comfortable on the ball, create more time + options. Topics include: footwork, creativity, body positioning, first touch, vision, pass selection v. , positional awareness, 1v1. Strikers This is all about scoring goals! Players will learn shooting techniques, 1st touch, volleys, movement, body position, support play and more. 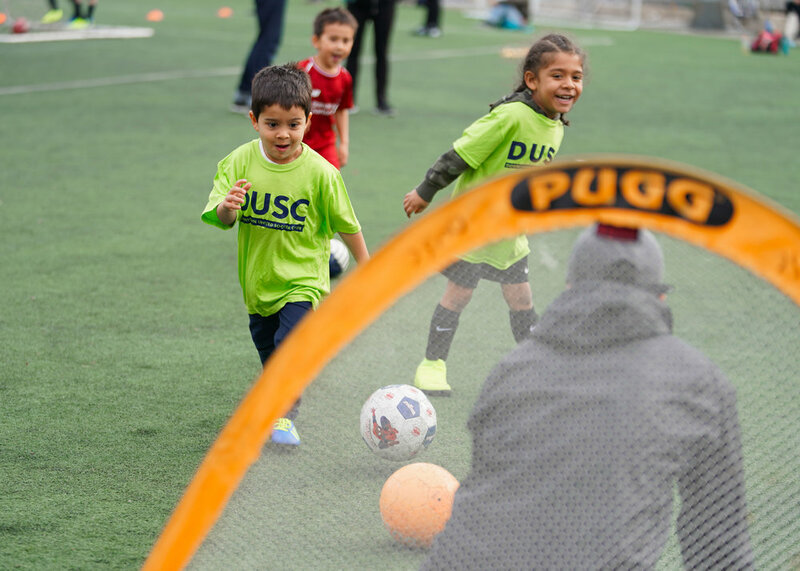 All classes are taught by our professional coaching staff teaching the “DUSC Way”. Players may be split into groups based on ability. Begins March 30. Runs 10 weeks straight. This coed program is designed to teach fundamental soccer skills in a positive environment with the use of creative and fun-based games. We want players to become skilled in possessing the ball, while working on their balancing skills and coordination. We will help your little one build confidence, leadership and social skills while emphasizing teamwork! Who are DUSC Classes suitable for? Is previous soccer experience required? Do you offer girls-only classes? How many players are in each group? When will you notify us about cancelled classes? Do you offer make-up dates? Can I drop off my son or daughter and pick them up later? No. Our classes are designed to cater for all levels of experience. Players may be split up based on ability. Our professional coaching staff will follow a 10 week curriculum, including; dribbling, passing, receiving, shooting and creativity. We aim to have a ratio of 1 coach to 10 players. For our youngest classes, ratios may be lower for more individual attention as necessary. We will play in the rain wherever possible, however, if the rain is torrential we will cancel. In addition, if rain is combined with low temperatures, we will cancel the session (especially for our younger players). Should we experience thunder or lightning we will cancel the session. We will communicate at least 4 hours in advance of any session being cancelled. Classes are on as scheduled unless we communicate otherwise. Due to high volume, please do not call or email to ask if class is still on. Yes. We will always offer a make-up date for cancelled classes. Sometimes classes are cancelled at short notice due to permitting issues or other constraints outside of our control. We will always communicate cancellations in advance; however, we thank you in advance for your understanding in this matter. You can register for the waitlist and you will be informed if a space opens up. We ask that all children are accompanied by an adult during each class. Players should bring a ball, water and shin guards. 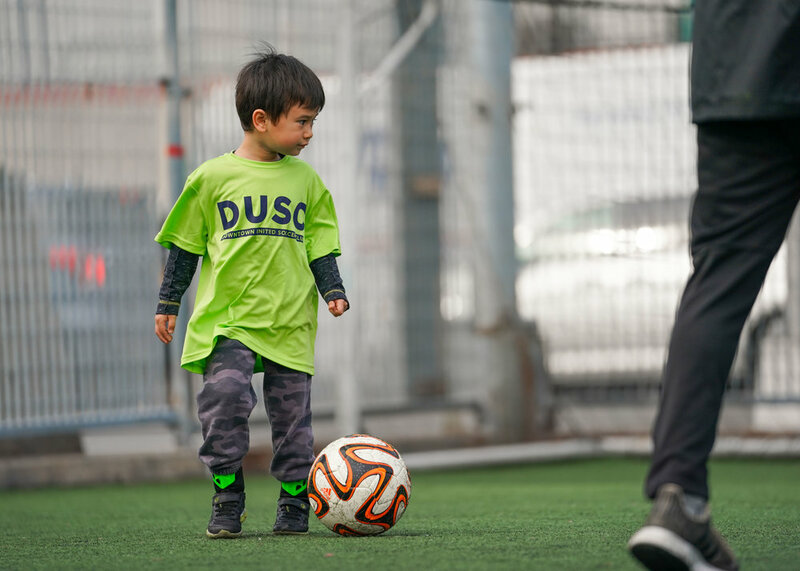 DUSC will provide each player with a T-Shirt that they should wear every week to class.